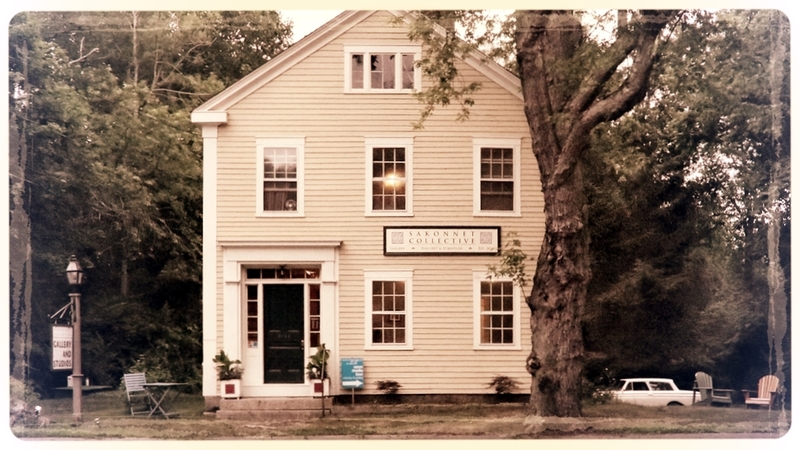 The Sakonnet Collective is a band of artists, makers, and skilled craftsmen who share studio and gallery space in Tiverton Rhode Island's Historic Four Corners District. Other than showing the work of our members, we also display a mix of locally sourced artworks as well as hosting work from visiting and guest artists. Fine Furniture, Mixed Media Art, Photography, Pottery Jewelry & more can be found at The Sakonnet Collective Artist Gallery. Local natives Stephen Kinnane and Padraic Manning started The Sakonnet Collective in 2008 after completing studies at separate Boston universities. Padraic, a graduate of The Massachusetts College of Art and Stephen a graduate of The North Bennet Street School, needed studio space once returning to Rhode Island from school in 2010. They quickly acquired and renovated a run down farm stand and turned it into a fully operating woodshop, three studio spaces, and a 1500sq foot gallery where they created and showcased their work. In 2014 they moved the Gallery and studios to Tiverton Four Corners to expand their audience and promote the Collectives mission: To create a better understanding and value for handcrafted visual arts.